Public communication of science has increasingly been recognised as a responsibility of scientists (Leshner, Science p. 977, 2003). Climate scientists are often reminded of their responsibility to participate in the public climate debate and to engage the public in meaningful conversations that contribute to policy-making (Fischhoff 2013). However, our understanding about climate scientists’ interactions with the public and the factors that drive or inhibit them is at best limited. In a new study, we show that it is the most published and not necessarily the most senior, which often talk in public, and it is primarily intrinsic motivation (as opposed to extrinsic reward), which drive them to engage in public communication. Political orientations, academic productivity and awareness of controversy, the topic raises in the public domain, were also important determinants of a climate’s scientist public activity. Future research should explore what is required to protect the intrinsic motivation of scientists. The online version of this article ( https://doi.org/10.1007/s10584-019-02414-9) contains supplementary material, which is available to authorized users. This study was conducted under the first author’s Fulbright Fellowship at Cornell University, USA. ME designed the study and wrote the paper; MB provided inputs and feedback into the paper and conceptual advice. BL supported data collection in the US and provided feedback into the paper. ME and JM conducted the data analysis and JM compiled the presentation of the data. Alley, R. B. et al. (2007) A report of Working Group I of the Intergovernmental Panel on Climate Change Summary for Policymakers, IPCC Climate Change. Cambridge University Press. Available at: https://www.ipcc.ch/pdf/assessment-report/ar4/wg1/ar4-wg1-spm.pdf. Accessed 22 June 2018. 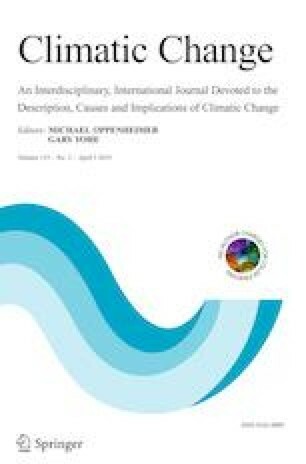 Schäfer MS, Schlichting I (2014) ‘Environmental communication media representations of climate change: a meta-analysis of the research field’. https://doi.org/10.1080/17524032.2014.914050.